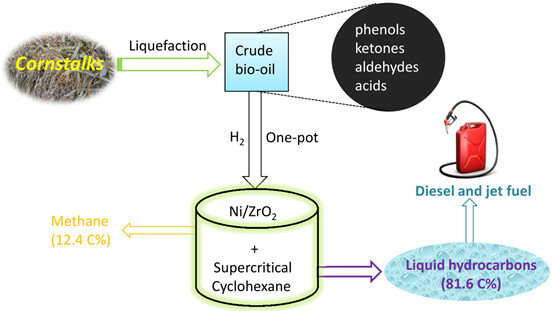 This study demonstrates a new route for converting bio-oil, prepared from the hydrothermal liquefaction of cornstalks, to diesel and jet fuel range hydrocarbons over Ni/ZrO2 in supercritical cyclohexane. Under relatively mild conditions (573 K, 5 MPa H2), we obtained a high yield (81.6 C%) of hydrocarbons with an excellent quality (90 % of diesel and jet fuel range hydrocarbons and 7% of gasoline range hydrocarbons). Ni/ZrO2 efficiently and stably catalyzed all types of compounds in the bio-oil to the corresponding alkanes via hydrogenation, dehydration, hydrogenolysis, decarbonylation, and isomerization, without polymerizations among the different reactive compounds in bio-oil. The activity and selectivity for diesel and jet fuel range hydrocarbons of Ni/ZrO2 showed no obvious changes after three cycles. Ni/ZrO2 was fairly stable in supercritical cyclohexane after 72 h reaction time. This strategy provides a novel high-efficient pathway for the preparation of high-quality hydrocarbons from bio-oil.